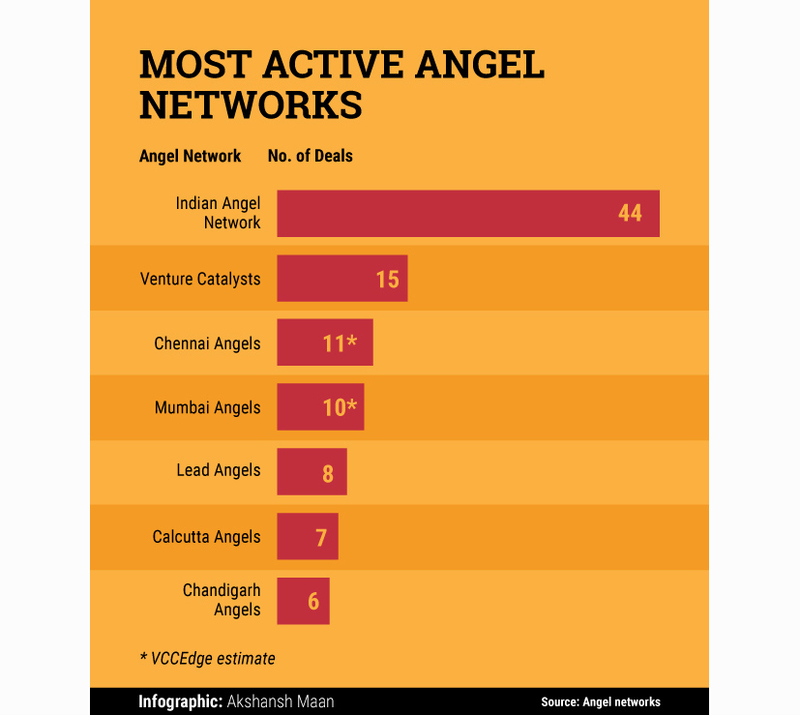 The year 2016 saw over 100 deals in the startup ecosystem by India's top seven angel networks, including newly founded networks such as Venture Catalysts and Chandigarh Angels. The chunk of these deals were closed by Indian Angel Network (IAN), which maintained its position at the top. IAN, which comprises 450 investors across 10 countries, closed 44 deals in 2016, of which 32 were fresh additions to its portfolio and 12 follow-up investments. Overall, it invested close to Rs 340 crore ($49 million) this year. Some of its key investments include PayTunes, Little Black Book, Robotics Works, Styledotme, Staqu and One Way Cab. "It has been a great year for us. We have seen the critical role that angel investors play in breeding innovative companies. On the other hand, IAN has helped investors build a risk-hedged portfolio spread across sectors, stages, geographies, enabling the kicker in investor portfolios," said Padmaja Ruparel, cofounder & president, IAN, in a statement. Mumbai-based Venture Catalysts came in second, with 15 deals. It invested in photo-intelligence company Siftr Labs, ticket-discovery tool startup Confirm Tkt, tech media platform Inc. 42 and men's personal grooming brand Beardo, among others. Its recent investments include grocery startup Supr Daily and car services startup GoMechanic. According to data from VCCEdge, the data platform of VCCircle, Chennai Angels and Mumbai Angels invested in 11 and 10 startups, respectively. The most recent investment made by Chennai Angels, which was earlier known as Chennai Entrepreneurship Trust Fund, was of Rs. 1.1 crore in agri-business startup E-Vegetailing. Its other investments include those in fintech startup Finance Buddha, home automation firm Silvan Innovation and beauty products and training services firm Syona Cosmetics. Mumbai Angels' key investments include those in content delivery platform WittyParrot, fitness marketplace Fitpass and digital marketing startup MintM. When asked what is it they looked for in a startup before backing it, Calcutta Angels said they wanted a clearly thought-out business plan, and some early evidence of traction towards the plan. Moreover, the startup should have the potential to be very big in the market opportunity being addressed.